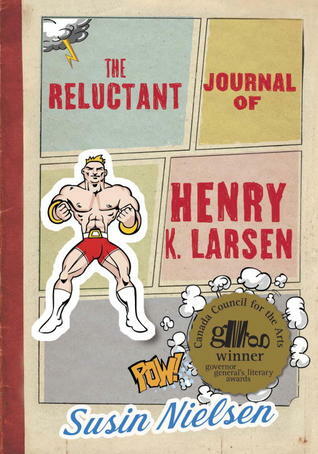 A while ago I wrote about reading The Reluctant Journal of Henry K. Larsen with my son. It was astonishingly good. 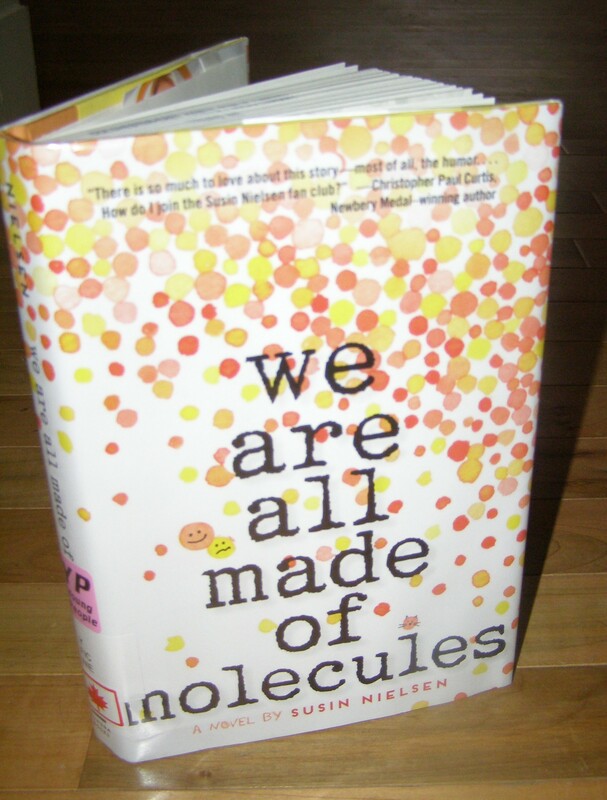 We Are All Made of Molecules is Susin Nielsen’s most recent book. I borrowed it from the library when my daughter had the flu; I thought she might like a few extra books to read while she recuperated. 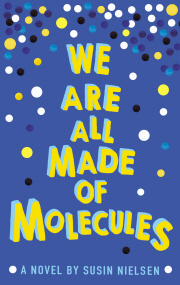 We Are All Made of Molecules, is a story that tells a very clear message: that we are all made of molecules. We are the same, we all matter, we all deserve to be treated equally and with respect. And, not only do we need to know this, we need to act on it. Stewart (a young 13) is academically gifted, but not socially. And he knows this. He is very aware that he is an easy target. Fortunately, he has had parents who love and support him and this has given him a confidence that he will need. Then his mother dies and he and his father have to figure out how to live without her. … just because you feel sad sometimes, doesn’t mean that you can’t also be happy. Stewart’s father, Leonard, eventually starts seeing Caroline, and they end up moving in with Caroline and her daughter, Ashley. Ashley is 14, her parents have just divorced because her father has announced that he is gay. She is at the top of the social ladder at school and is very concerned that she stay there. At all costs. She’s nasty to her parents, she’s mean to her friends, and she’s awful to her new step-brother Stewart. He embarrasses her. She is also ashamed of the fact that her father is gay, even though she had never before thought of herself as homophobic. She tries to keep this fact from her friends, and her new boyfriend, Jared. Jared is where things get ugly. And intense – the word my daughter uses to describe the mounting tension as Ashley’s determination to stay popular escalates. He’s got psycho eyes. You know, like he’s kind of dead inside. Like he’s constantly trying to figure out how a normal person would act. This book explores themes and situations that many kids are facing all the time (not mine, though. Never mine). And it doesn’t shy away from the terrifying reality of the internet. Bullying, homophobia, sexual assault, cyber-bullying, and the importance of consent. As was the case in The Reluctant Journal of Henry K. Larsen, a powerful book about the consequences of bullying, Nielsen writes about these issues with insight and humour. In fact, it was hard for me to imagine that the story could get as intense as my daughter ensured me that it would, because of Nielsen’s light touch. For example, Ashley is talented in some ways, but not in others, and she is continuously using the wrong words; “joie de beaver”, “high school is a doggy-dog world”, “taken for granite”. She also is forever forgetting the name of Stewart’s cat, Schrodinger, and instead calls him Shopping Cart, Shoe Box, Shoo-fly, etc. Some reviewers on Goodreads don’t like that Ashley comes off as dumb, but why not? when the message of the book is that everyone belongs despite our differences. Some complain that Ashley and Stewart seem too young for their age, but I don’t agree. 14 and 13 is young (so young! ), which is why life at that age can be so hard (and scary) at times. Ashley has to make some hard decisions, and come to discover some truths about herself that she may not like. Stewart is there to help her (whether she likes it or not), while dealing with his own challenges of starting a new school and fitting in with a new family, while still grieving for his mother. Stewart is an exceptional kid. I love these posts! Did you read it separately or did you read to her? We read this separately. I’ve been curious about this book, but have so many of my own from the library, so I wanted her to read it first and let me know if I should read it, too. Good call on her part. (I’m also partly curious to know how well she knows me, book-wise). What a great post and review. This book sounds both fun and educational, and it looks like it could lead to valuable conversations about difficult or important topics. I also appreciate the science of the title as well — yes, we are all technically made of the molecules of matter created so many years ago! Stewart’s the one who came up with the molecule theory after his mother died. He figured her molecules were still around, which helped him cope with his grief. My daughter clams up when it comes to serious discussions (the discussion become very one-sided) – but all the more reason for her to read the good books (and for her to know that I read them, too)! I love that you two read this together! Such an interesting point about the way they characters were portrayed – I think sometimes YA makes people think 13 year olds act much older than they really are. Did your daughter think they came off seeming young? I don’t know. It sounds like they are trying to wedge every hot issue possible into this book. You didn’t feel that? It doesn’t feel like that when you’re reading it, because all these issues get all mixed up together – bullying, sexual assault, and consent all go hand-in-hand. And the homophobia and bullying also do, etc. But, when you pick it apart to describe it, it does sound like a lot! Yeah, I had a comment from a reader the other day about how she dislikes modern fiction because of all the issues and hot topics it seems as if it is trying to cover, and that made me think of it. It does seem as if some authors are taking on those issues because they think their books are more likely to be published or read. I have to admit to getting tired of certain topics sometimes, but a lot depends on how they are handled. That’s true. I have been been pleasantly surprised with both of these books by Susin Nielsen. However, I don’t read a lot of YA, so maybe someone who does will find they’re the same as everything else out there. This is the first book I’ve read that deals with putting photos of someone on the internet without their consent, which is huge for kids to learn about these days (one of my biggest fears, for sure). You know, this book had been on my radar but I never really knew what it was about, so I forgot about it. This sounds kind of great and I love that you read it with your daughter so you could both talk about it! Despite reading a couple of reviews about it when it first came out, I still didn’t really know what it was about when I read it. I was pleasantly surprised that it got into some pretty serious issues! At first, I wondered where it was going, but then suddenly it was there. I applaud you for reading with your kids, though when I first saw the title I was expecting something scientific. I am glad that I don’t have to deal with all of these issues just yet. Yes, definitely take advantage of their innocence for as long as you can! What a great recommendation. I would have enjoyed reading this with my boys when they were young. Please continue sharing your family reading; I for one love it. This review is so interesting, especially as you discuss your daughter’s reactions, too. Great review! My daughter read This One Summer last year some time – I should have read it when she did, but maybe I’ll try getting it out of the library again for myself! One thing I’m really liking about Susin Nielsen’s books are how current her stories are. Learning the seriousness of posting unwanted photos on the internet is huge for kids these days, and it’s the first I’ve read about it. I also think my daughter is going to take the message more seriously coming from a book than coming from me (unfortunate, but true!). Excellent! Sounds like you’re really helping your daughter learn to navigate teen life! I too love that you read this with your daughter and included her thoughts in your review! I read about one YA book a year—I think it’s because I’m terrified (for my son) of what “kids these days” have to face with the ubiquity of our online social lives. It *is* terrifying. But you still have some time before it hits! That’s tricky. But when she grows up she’s going to tell everyone what an awesome parent you are. It’s fantastic that your read with your daughter and then discuss books! It must be great for her to know she recommended a book to you and you liked it, and you could both share your thoughts. It is fun! I’m hoping the older she gets, the more often we can do it! It’s so heartwarming to learn that you read with your children, Naomi. You inspire me. 🙂 And, the book sounds wonderful. 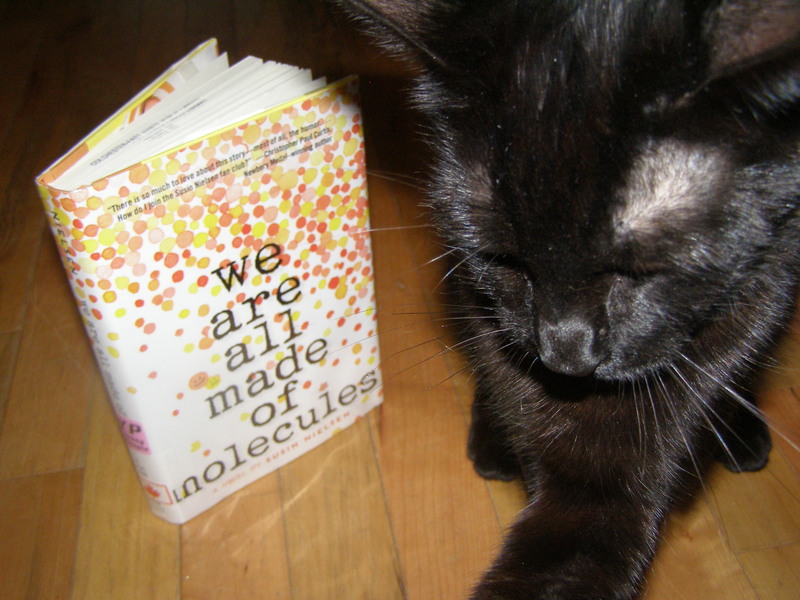 Love the cat and book pic! This sounds like a really intense and powerful read Naomi. It was just right for her age!